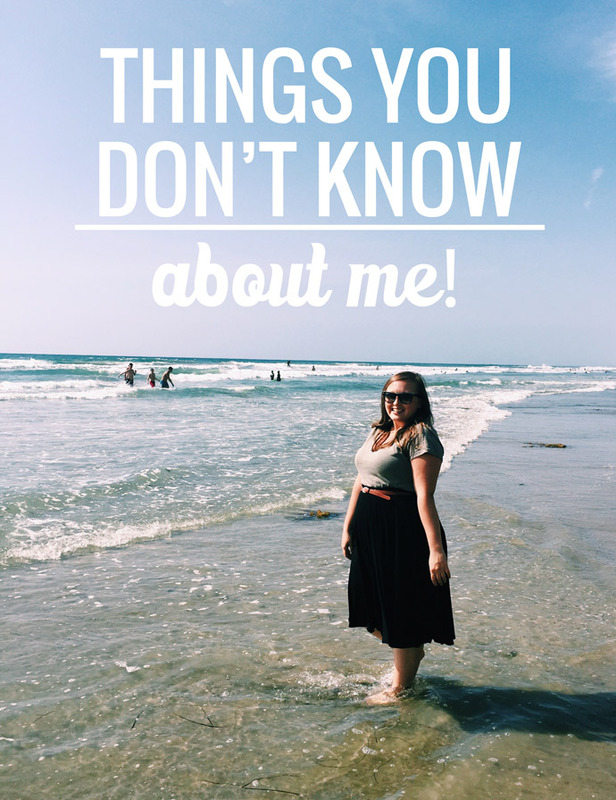 Foreign Room: 10 Things You Don't Know About Me! Hey there! It has been a while! I'd like to say that in my absence I've been doing something ultra cool/productive like training for a marathon or writing a book, but alas, I haven't been. I have been traveling here and there on little adventures though, as well as working and going to school and trying to get back into this blogging thing (with little success, obviously)! I've also been considering starting another round of Whole30 soon, working on a couple design projects for a friend, and doing my best to get my affairs in order to start my new school in the fall. There are a lot of new things happening in the near future and I'm starting to look forward to them! In the meantime though, one of my main goals is to bring this blog up to speed and get back to posting regularly! I have missed it and all of the lovely people who I have been able to connect with through it. I've been a little bored with the design of my blog lately, however, and am trying to decide how to change things up a bit. For me, when my blog isn't in an aesthetically good place, I'm not as motivated to post and instead make myself crazy trying to figure out what to do with it! But, I'm going to just let it go for now and get back to what's really important here: writing and community! 1. I am very indecisive. I always change at least once or twice when getting ready, can never decide what to order when I go out, and have a hard time deciding between things that I want to buy. 2. When I was a kid, I wanted to be an oceanographer or marine biologist, but when I realized how many science classes I would have to take and that I didn't really like science, I changed my mind. I loved dolphins so much (and still do!) and thought that being an oceanographer meant I could just hang out with them all day. 3. I am a bit of a picky eater. Seafood isn't my favorite and I can be particular about how I like things to be made. I'm trying to expand my horizons though and Dai has been a big help with that! 4. My dad and I like to watch pretty girly shows together, like The Mindy Project, Hart of Dixie, Everwood, Gilmore Girls, 7th Heaven, and Project Runway. 5. I have a Fitbit One, but most days I don't meet my step goal and I always get beaten by Dai and my sister haha. 7. Marly sleeps under the covers, cuddled up against me as the little spoon every single night. 9. I became a nanny because I love being an aunt, so I figured that if I love to hang out with kids, I may as well get paid for it :) It was one of the best decisions I have ever made! 10. I played softball in high school and was even the team captain one year. Both years that I played, our team was undefeated! cherry, and Talenti salted caramel. 12. I've always wanted to take a ride in a hot air balloon and go scuba diving. 13. I don't mind watching movies over and over again. To keep this going, I'm going to challenge Abby, Britt, Leah, Danica, and Morgan to share at least 10 things we don't know about them as well! P.S. I am almost ashamed to admit that Dai and I have watched four complete seasons of Pretty Little Liars in just one month. I calculated it, and that comes out to be about 67 hours of PLL. Oh my gosh, I think we are addicted! Love this post!! my cats like to snuggle under the covers too, cutest thing ever :) I will definitely be thinking about what to share -- thanks for the challenge hahah!! CHALLENGE ACCEPTED! :D Great post, Jess - I aww'd at Marly sleeping under the covers with you. If you haven't heard about the new PMS Ice Cream, you should Google it immediately! Why didn't I ever think of doing that with my starbucks cups? Haha! I also used to want to be a marine biologist or oceanographer when I was growing up! But I figured there was no hope since I live in TN, a lovely little landlocked state, haha. Thanks for tagging me girl, going to work on the post soon! That salted caramel ice cream..I could survive off of it. Aww kitties under the covers! Haha can't wait to see what you come up with! Woohoo! Can't wait to read your post! :) I Googled the PMS ice cream--how hilarious!! Haha, glad we think alike! Seriously. It is pretty magical.